In many HD video conferencing applications, the video display, loudspeakers and camera are located on one wall of a room, while the microphones responsible for capturing the near-end participants are located on the conference table. 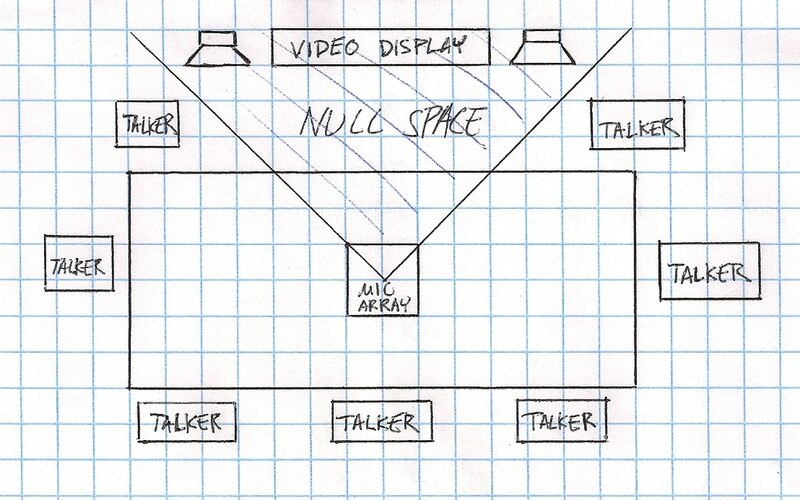 The physical separation between the loudspeaker and microphone helps to weaken the acoustic coupling and lower the Echo Return Loss (ERL), but the playout of the far-end audio from the speaker will be at a much greater level than standard conversational speech levels. This can result in poor acoustic echo cancellation (AEC) performance due to saturation in the microphone signals. Table-top or ceiling microphones are designed to have an omni-directional response, so everyone in the room can be heard equally as well. However, in this scenario we do not want to pick up sound from the direction towards the loudspeakers. This is the inverse of the standard microphone array acoustic beamforming solution. Instead of having a single beam pointed in one direction and rejecting all others, the beam is inverted such that there is a null in one direction and reception in all others. This null-formed solution does require a priori knowledge of the direction of the loudspeakers because the speech emanating from a loudspeaker and speech emanating from a real person cannot be distinguished. With a null directed only towards the loudspeakers, the ERL is reduced allowing the AEC to perform well, while all near-end participants will still be heard equally. VOCAL Technologies, Ltd. offers a variety of beamforming solutions, including those tailored specifically for video conferencing applications. Please contact us today to learn more.